You will be given a Free reference e-book to read which has 338 pages And the test will be based on that e-book. Comptia RFID+ (Radio Frequency Identification) certification refers to the standard certification primarily designed for qualified and competent RFID professionals. It can also be defined as a vendor-neutral and international certification designed for IT professionals who have completed around 6 – 24 months experience when it comes to using different RFID technologies. The exam which you need to take to certify you as an expert in this field works in measuring your ability to maintain, troubleshoot, install and repair the software and hardware functionality of different RFID products. Comptia RFID+ is also capable of providing a baseline for the required skills and knowledge of RFID professionals, thereby allowing business owners and potential employers to employ the most qualified individuals and professionals who can show sufficient credentials as a means of proving their competence in the industry. One of the major advantages of owning a certificate in this field is that it gives you the chance to easily update your background and knowledge while also fully understanding the capability and value of the different RFID technologies. This works if you have plans of impressing potential employers with your unquestionable skills and knowledge. 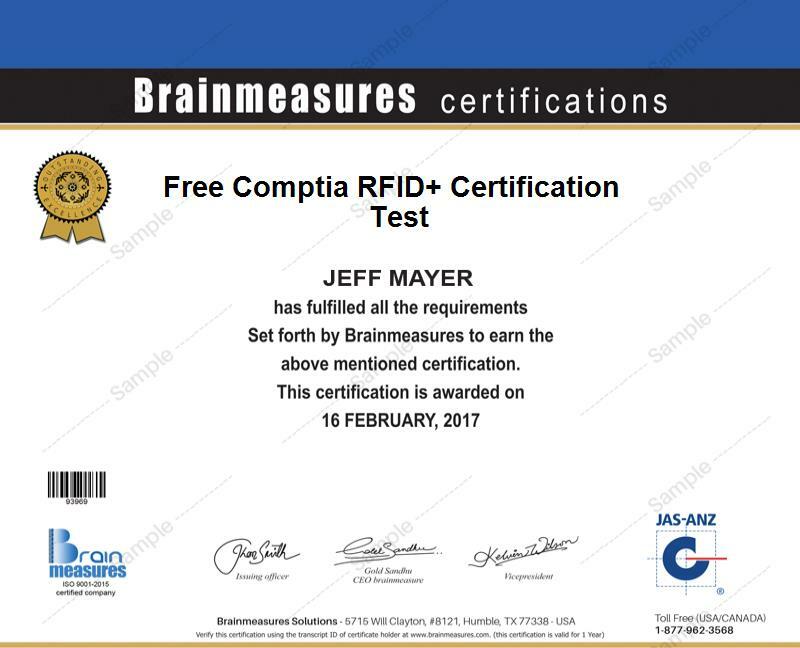 If you have longed to become a certified RFID+ expert, then note that Brainmeasures can provide you with a free Comptia RFID+ practice course. The free study guide which comes along with the course as well as the free practice test are expertly developed so you can expect these to help you in boosting your chances of passing the actual exam. The free Comptia RFID+ certification practice course which is now offered by Brainmeasures aims to provide all those who have decided to enrol in it with the most detailed and accurate information about the field. This free practice course highlights the most essential topics related to Comptia RFID+ so earning a certification in the field will no longer become a problem. Brainmeasures has also been recognized in the field of providing the best online certification programs and courses so you have an assurance that the study guide included in this free practice course can help you in completely understanding its various aspects. A free Comptia RFID+ practice test also forms part of the course and this is extremely useful in your attempt to get a clearer overview about the whole process of taking and passing the exam. All these inclusions in the practice course work in guiding you towards the process of preparing yourself for the certification exam. The free Comptia RFID+ practice course introduced by Brainmeasures to the public is proven to be really useful for all those who plan to easily handle the complexities associated to taking the Comptia RFID+ certification exam. It is intended for all aspiring and practicing IT professionals, RFID technicians, Auto-ID and networking professionals, RFID technology consultants and administrators and any other individuals and professionals who are interested to learn more about all aspects related to RFID technologies including their configuration, installation and maintenance. Your aim to start earning an even higher salary can also be reached if you successfully passed the Comptia RFID+ certification exam. It gives you the chance to work as an RFID electronics technician and start earning at least $46,000 every year. Working as an RFID software engineer is also very rewarding since it entitles you to enjoy a salary of around $55,000 to $91,000 yearly.